Additional Info: Tobi Akinjobi. A versatile organist with immeasurable contributions to several african and western music at home and abroad•A one time national president of music students association of nigeria. Happy hour sees music as the cradle of life and preaches team work and professionalism•started music at age five as a choir boy at the first church in nigeria, Where he later served as a pianist•An organ instructor with encompassing theoretical and classical background in music. work as the piano instructor. At AMAZINGMUSICSCENE. 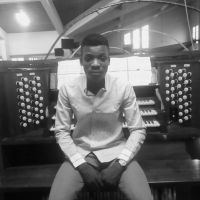 Also a concert organist at gracedion chorale societyc/o tenstrings music institute.Presently the church organist of all saints anglican church. Humble, passionate and Fun to be with.